Il sito di abbigliamento e accessori Romwe lancia un concorso, sarà possibile vincere fino a 150$ in buono regalo dal loro sito. 1. 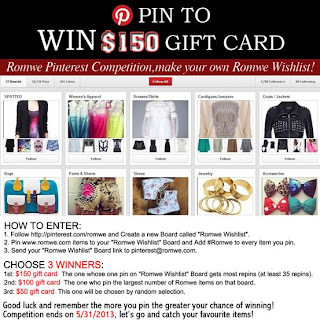 Seguire http://pinterest.com/romwe e creare una nuova board chiamata "Romwe Wishlist". 3. 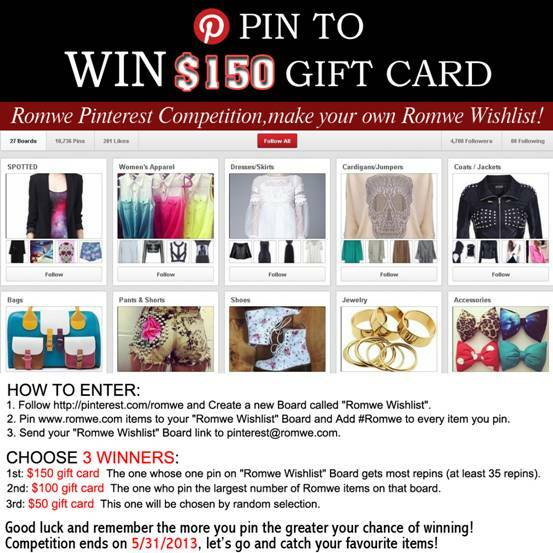 Invia il link della tua board a pinterest@romwe.com. Il brand Keyra' di Alberto Cacciari, specializzato nel curvy fast fashion, abbigliamento femminile per taglie morbide, ha lanciato un un casting per la ricerca di una modella curvy non professionista che sara' la testimonial del marchio per le prossime due stagioni. E' possibile iscriversi al casting online entro il 20 maggio sul form del sitowww.castingkeyra.com dove potrete anche leggere il regolamento. Il casting live si terrà a Bologna entro il 31 maggio (luogo e data da definire) con preavviso di 10 giorni. He constantly kept preaching about this. I mst certainly will send this information to him. for very long and want to ease into a fitness routine. also becoming increasingly popular with children from all over America. stop by their studio at 585 Hazard Ave. Meat leftovers (steak,bratwurst,sausage,hamburger). as adventure camps, academic camps, athletic camps, fantasy camps and religious camps, etc. and strengthen muscles you may not have used in a long time. I'm really impressed along with your writing abilities and also with the format in your weblog. some point. I want to encourage you to definitely continue your great job, have a nice weekend! knife and fork, the Chinese use chopsticks. (2003): Democracy in Israel and Palestine; Haaretz newspaper 18 May 2003.
post I looked at. And on this article "Occasione della settimana: Contest Romwe e Casting Keyra' modella curvy". remarks appear like written by brain dead folks? :-P And, if you are writing at additional online social sites, I'd like to follow you. Could you list all of all your social pages like your twitter feed, Facebook page or linkedin profile? of. John Forsythe, the mysterious Charlie stared the show by saying, "Once upon a time, there were three little girls who went to the police academy. Like any competitive game, League of Legends has its share of bad sports and rude smack talkers. Dala and question her about her unusual interest in the human body. There are even a few generators that are run by pedal power- you petal a stationary bike to produce power but these do not power large items. some extra funds towards the store. ѕuggest to my friends. I'm ѕure theу will be benefited fгom tɦis web site.